16pp. white paper wrapper, front and back cover printed in red ink. 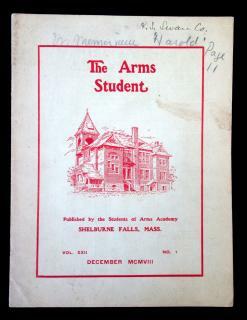 Small illustration of the school on the front cover, also printed in red. School newspaper for the winter term in 1908. Included possible course outlines, the scores from recent sporting events, recent scientific discoveries, alumni news, and more. In the editorial section, there are 8 short narrative pieces: Winter - Their First Thanksgiving - Winter in the Adirondacks - My Experience with a Burglar - Civil Service Positions - "The Lark" - School Fun - Class Notes. Topics range from informational, like the short piece encouraging students to join the civil service, to the comedic, like the story "Their First Thanksgiving", the tragic tale of two turkeys, reading the newspaper as it blows into the barn, as they wonder what 'Thanksgiving' is. Ends with 6 pages of advertisements for various local businesses. Measures 9" x 6 3/4". Small size book constructed of a front and back book cover two leaves of lined laid paper cut to fit the covers an held in place wtih thread. Old sewing repair holds covers together at backstrip. A button is affixed to the front cover and a leather closure is sewn on the back cover with a buttonhole that clasps over the button. When opened it reveals the daily activity of the lad of few words. The pages are titled at the top of each month beginning with January 1857. Many of the lines in the first half are occupied with "To School" Some additional lines include: -school didn't keep , setting up wood, - made an axe handle - did nothing - Do work for Brown - Haying - A happy mood - Setting up wood - Killed the hog - made a gate - Picking Rocks - Cutting Bushes - To work for Brown- Holding plow for Clough - Drawing Stone and Plowing -Picking Apples - Making "sider" (cider) - Drawing dung - a couple of lines of secret code . Each of the tasks is repeated numerous time. The life of a young boy in an 1850s tweets! Measures 4 1/2" x 3". .
Thirty-one (31) school girl drawings of girls and women in Grecian bend bustle style costumes. Many of the images have been named by the artist. Thirteen (13) additional drawing by a different hand, most likely a boy, Native Americans, Soldiers. All naive. Three (3) finished in watercolor. Delightful. Measures 7" x 4". Fragile. Three (3) carefully constructed homemade books with pencil drawn sketches of the day to day life of one young girl, Ethel Pratt. The books appear to span a period of time beginning when a young talented girl created simple naive sketches, some embellished with crayon. A loose page depicts a young girl reading a book to a bunny with other rabbits looking on. Others depict her friends, often with dolls. One scene shows a horrified young girl watching a dog carrying her dolly away. As she matures the drawing become more complex and boys begin to appeal..